National Motorsports, the Canadian importers for the Hyosung brand of motorcycles is bringing an electric scooter to Canada, dubbed the E-Moto G-300LX electric scooter. 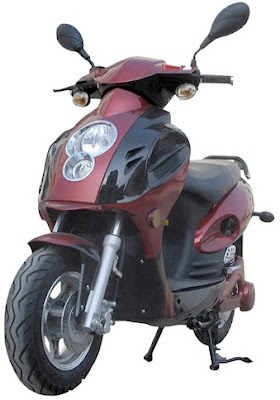 G-300LX electric scooter may look like a typical scooter but instead of a small gasoline engine, the G-300LX is powered by a 3 KW brushless DC hub motor with a Lithium Iron Phosphate battery pack. Max torque is claimed to be 88.5 ft-lbs at a near instant 900 rpm, and 3.2 horsepower. It should be whisper quiet AND pretty quick off the line with torque numbers that high. 3.2 hp should be enough power to get you to a top speed of 67 km/h with a range of up to 80 km. It's not likely that you'll get 80 km, particularly if you're driving enthusiastically or near top speed. How far you'll get is also dependent on other factors such as rider size, terrain and weather). But if you don't have a long commute it should be a perfect tool for getting to the office, the grocery store, or just a ride around town. The scooter produces no emissions of course because it runs solely on battery power. A full recharge should take 2-3 hours. The ten inch wheels feature disc brakes front and rear. The e-moto has a claimed "net weight" 114 Kg (that includes the battery). It doesn't list a "wet" weight like most motorcycles because it doesn't have fluids! Special thanks goes out to the folks at CMG for the photo and details on the E-Moto.